Running a race on the 4th of July has become somewhat of a tradition of mine. I looked up other options and found a couple nearby, but when it came down to making a decision I went with the one I’ve done twice before. Why? I guess because I like the 10K distance and the others were 5Ks, because it’s a race I’ve done before so I can gauge my personal progress (or lack thereof), and because I like running through the neighborhoods and basking in the community support. This year my husband was able to run it with me, his first time doing this race. Having done this race twice before I knew what to expect. I planned to arrive about an hour before the race started in order to pick up our bibs and swag, hit the potties at least once, and warm-up at a leisurely pace. 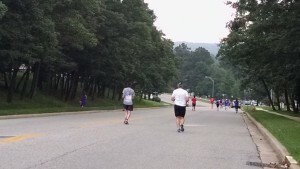 Although I didn’t talk to my coach about a race strategy, I thought I would follow the negative split pattern that he’d recommended for my last 10K at ZOOMA Annapolis (which I ended up not following at all). It’s possible to pick up bibs the night before the race, but I don’t bother. It’s a small event and since they set up tables in the school parking lot to distribute bibs and t-shirts before the race starts, there’s plenty of time to do what we need to do the morning of the race. In fact, it took us longer to walk a few dozen yards across the parking lot to get from our car to the table than it took us to receive our bibs. 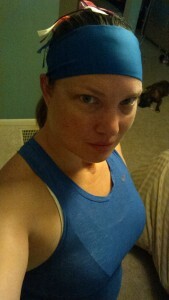 Blue shirts this year. Nice change from the red. 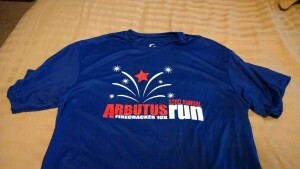 The only swag given out at this race is the event shirt. This year we got blue tech shirts with the event logo. The last two years we got red, so this was a nice shift. And they went back to a design more like the one from two years ago, which was much better than last year’s. Overall we don’t get a lot of stuff for what we pay for the race, but since it’s a community fundraiser I don’t really hold it against them. People don’t really dress up for this race; many of the runners are pretty serious athletes and wear their local running club shirts instead of festive outfits. But since the race is on the 4th of July I like to take the opportunity to wear something a bit more patriotic. I did not set out to wear a costume, but the skirt I wore definitely had a Captain America vibe so I let the theme play out. 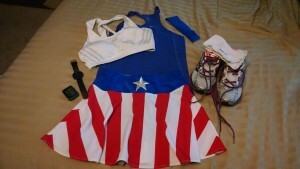 You can never go wrong with a Captain America running skirt. What I wore: “USO Girl” Sparkle Skirt with built-in shorts, royal blue Nike dri-fit tank top, white Adidas sports bra, royal blue Bondi Band headband and red/white/blue ribbon hair tie, Injinji socks, Brooks Adrenaline ASR 11 shoes (not the ones pictured: I changed them after looking at the weather forecast), Garmin Forerunner 620 and Gymboss interval timer, and Amphipod hydration belt. There’s not much going on pre-race at this event. The main reason to get there early is (1) to get good parking right in the school lot, and (2) have time to use the bathrooms. There is a small restroom facility down by the school sports field that I normally use instead of the two port-a-potties in the parking lot. However, there seemed to be some problems with the real bathrooms this year: both the men’s and women’s restrooms had plumbing problems that caused at least one toilet on each side to stop working, and toilet paper was pretty scarce. Even so, we got there early enough to wait for the facilities manager to fix the toilets and that was still preferable to waiting in the port-a-potty line. Nothing better than a running even to kick off a holiday celebration. After hitting the toilets we walked around the school to warm up our muscles a bit, until it started to rain and we headed back to the car. They had music playing loud enough that we could hear it inside the car and we could keep track of any announcements they made. About 15 minutes before the race started we hit the bathrooms again and then walked back up to the starting line. Because we had to wait in line for the toilets, we hadn’t quite made it to the road by the time the National Anthem started. We stopped to listen and then hustled to get to the road before they released the runners. My husband and I were literally the last people to cross the starting line and it started raining again almost immediately after we crossed. While Jake was able to make his way further up the pack, I stayed pretty close to the end. 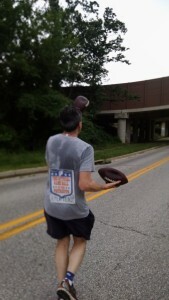 But the back of the pack was pretty great because our local juggling runner (who normally passes me at about mile two in this race) was having trouble with his deflated footballs and we ended up running almost the entire race together. The Official Football of the Patriots…Deflated! Yup, this is Baltimore! The course itself was the same as in past years. The first mile tends to be mostly uphill, then the next couple of miles have some great downhills, then it’s up and down for the next couple of miles, and the final half mile or so has a steady uphill along the back of the school up to the cemetery until you round the corner and sprint straight down to the finish line. Most of the course is through residential neighborhoods, and even with the rain some families were out on their porches cheering on the runners (this is where staying so close to the juggling runner paid off—everyone cheers for him as he passes and I can pretend that they are cheering for me). The rain did keep a lot of the spectators inside, but there were still several church and school groups bravely manning their water stops and keeping our spirits up. For what this race costs, it seems like we should get a SMO. But since it’s a fundraiser for the local community fund I understand why we don’t. I finished the race just a few minutes before the awards ceremony was scheduled to start. We headed over to the flat-bed trailer that was serving as the stage…just as the rain started again, this time in earnest. This rain was much harder than what we had during the race and since we weren’t running it felt much colder. A Casual Runner focused for the race. We knew we wouldn’t be getting any awards, so we decided to just get in the car and leave. They do have food available for runners after the race—usually hamburgers, hot dogs, chips, and fruit—but the food was on the other side of the parking lot and I didn’t make it that far before the rain started. Instead, we went home, showered and napped, then headed out to a local burger joint to satisfy our post-race burger and shake cravings. After having emotional, patriotic songs surprise me at the end of this race for the past two years, I created a playlist that I thought would prevent any such situation from happening again. And it worked for most of the race—I had a great mix of early 2000s pop like Adam Lambert’s “Whataya Want From Me” and All-American Rejects’ “Move Along”, 80s/90s rock like Billy Joel’s “We Didn’t Start the Fire” and Bruce Springsteen’s “Glory Days”, and girl-power anthems like Kelly Clarkson’s “What Doesn’t Kill You (Stronger)” and Katy Perry’s “Roar”. I did have a close call with Poison’s “Something to Believe In” rotating in toward the end of the race, but it was followed up with something upbeat and mindless so the tears were averted! I do not know what it is about this race, but it has a certain charm that keeps me coming back every year. It’s kind of pricy for a 10K with no SMO. It is hilly, the weather has not been great the past two years, and it is a fundraiser for a community that I do not live in. Still, I really like this race and there is a good chance I’ll be back. ← First Anniversary Top Ten Celebration!